In a closely watched speech marking 40 years of market liberalisation, Chinese President Xi Jinping says China will continue to reform, but at its own pace. President Xi Jinping yesterday vowed to continue the journey of reform and the opening up of his country, but warned other nations not to impose their will on China or interfere in its development. In a sweeping speech lasting 1-1/2 hours, the Chinese leader took stock of the great strides China has made in the past four decades since it embarked on a campaign to lift itself from poverty and oppression, and urged his countrymen to "create new and bigger miracles" that would earn the respect of the world. President's Xi's milestone address at the Great Hall of the People in Beijing to hundreds of officials, business leaders and diplomats is a culmination of a year of celebrations and events marking the 40th anniversary of the country's transformation led by patriarch Deng Xiaoping. While he paid tribute to reformers like Mr Deng and others who have contributed to the endeavour over the years, Mr Xi also struck a more ambitious, if defiant, tone, maintaining that China's reforms must be in line with its goal of developing a socialist system with Chinese characteristics. "China is a massive country, with a population of more than 1.3 billion people and a civilisation extending back more than 5,000 years. "When it comes to reform and development, there are no textbooks that teach the golden rules, nor are there expert teachers to dictate such rules to the people of China," he said in an assertive speech that was long on broad strokes and short on specifics. "We must respect the right of people of all countries to choose their own development path, safeguard international justice, advocate the democratisation of international relations, oppose the imposition of one's will on others, oppose the interference in other countries' internal affairs, and oppose bullying," he said, in what could be viewed as a veiled reference to the United States, with which China was locked in a trade war. The two countries are on a 90-day truce while they thrash out trade terms. But, in the same breath, Mr Xi reiterated an oft-repeated assurance of China's peaceful rise, saying that "no matter how far China develops, it will never seek hegemony". He promised to support the private sector, promote innovation and solve the unbalanced development that has resulted in a huge wealth disparity in the country, but did not go into details. Mr Xi also pledged to build a strong army that would not only safeguard China's sovereignty but was also commensurate with its global status as an emerging superpower. Reasserting the "one China" principle, Mr Xi said, to thunderous applause from the audience, that "not an inch of the motherland's sacred territory can be broken up". In a symbolic gesture, China also honoured 100 Chinese nationals and 10 foreigners for their contributions to the country's reform and opening up, including Singapore's late founding prime minister Lee Kuan Yew. Scientists, artists and entrepreneurs such as Alibaba founder Jack Ma, Tencent's chief executive Pony Ma and former NBA basketball player Yao Ming were on stage to receive their awards. Asian stocks dipped yesterday as investors, who had anticipated that Mr Xi would address China's slowing economy, were left disappointed. China has honoured Singapore's late founding prime minister Lee Kuan Yew for his deep involvement in China's modernisation journey. Mr Lee was one of 10 foreigners awarded the China Reform Friendship Medal yesterday at a ceremony at the Great Hall of the People to mark the 40th anniversary of China's reform and opening up. 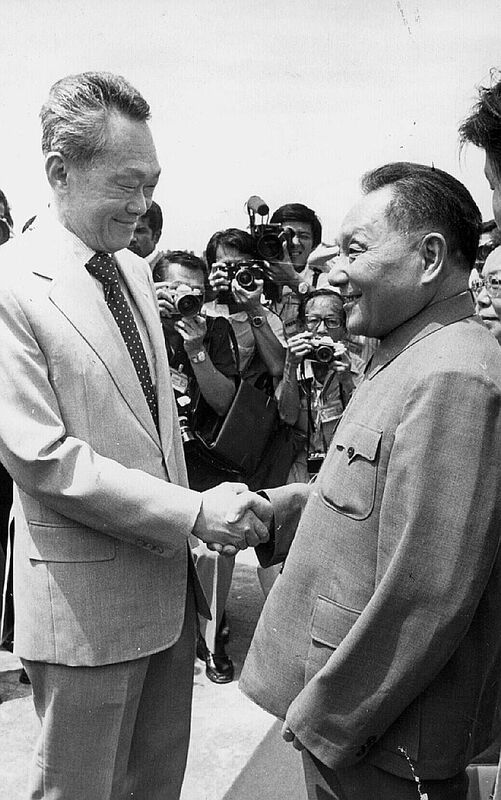 Chinese leaders have long regarded Mr Lee as the principal architect of Sino-Singapore relations, and he is one of a handful of world leaders to have met all five of China's top leaders, from Mao Zedong to current President Xi Jinping.